Both designs have three windows and a chimneypiece. Differences (which are not very great) lie in the details of Gothic ornament so that, for example, drawing  has the addition of a vertical shrine opposite with the same canopy as the chimneypiece. The office Day Book (29 January 1805) notes that as well as a plan and section, two 'perspective views' were sent to the Marquis of Buckingham. The drawings catalogued here are likely to be copies of those perspectives. 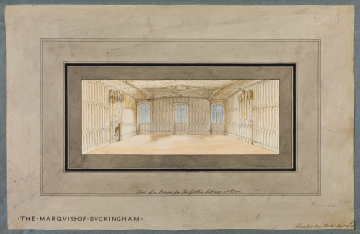 M.McCarthy's article: 'Soane's 'Saxon' Room at Stowe', Journal of the Society of Architectural Historians, (volume XLIV, May 1985, pp.129-146) states that the second design was preferred.